It's not App Store approved, but for those in the audience who've jailbroken their iPhones, the Clippy add-on offers some reasonable functionality to copy and paste across apps. 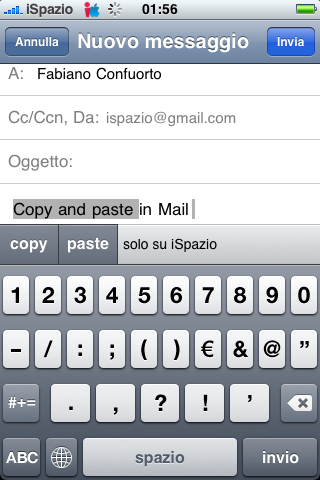 Clippy works by adding copy and paste buttons to the iPhone's keyboard which can be activated on any editable text (emails and SMS). To begin copying, you click "copy." Then you highlight the text. Then you click "copy" again. To paste, you just click "paste."